California police shot dead a 73-year-old dementia sufferer after reports he might have had a gun, only to find he was carrying a crucifix. Bakersfield officials said officers opened fire at Francisco Serna seconds after he was pointed out to them. Police said he refused officer commands to take his hands out of his pockets, and neighbours had complained he was threatening people and might be armed. A 2015 study rated Bakersfield Police Department as the deadliest in the US. 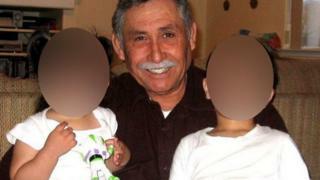 Mr Serna's family said the shooting in the city, 110 miles (177km) north of Los Angeles, was murder. "It is difficult to accept that our dad's life ended so brutally, abruptly and with such excessive violence," the family said in a statement read aloud during a candlelight vigil at their home on Tuesday night. "We feel our dad was stolen from us at a time when our family should be celebrating the holidays, birthdays and making happy family memories." The retired father-of-five was shot to death in his neighbour's driveway at around 00:45 local time on Monday. He was walking towards a police officer who was responding to a report of an armed man acting threateningly, officials said. Bakersfield police chief Lyle Martin said Officer Reagan Selman fired seven shots at Serna when he was about 15-20ft (4-6m) away from him. Officer Selman, and six other officers present, have been placed on routine administrative leave. Chief Martin initially said the object found in Mr Serna's pocket was difficult to describe, without offering further details. But a subsequent statement from Bakersfield Police Department read: "During a search of Mr Serna a dark colored simulated woodgrain crucifix was recovered. "Mr Serna was not armed at the time of the shooting. No firearm has been recovered." Police say that Mr Serna accosted two different people in his southwest Bakersfield neighbourhood, before the fatal encounter with police. In the first incident, a neighbour said Mr Serna was banging on windows and doors outside his house on Sunday afternoon, while keeping one hand on an object inside his pocket. When the man opened his door, Mr Serna grabbed his hand to pull him outside while challenging him to fight, according to the neighbour, who did not initially report the incident to police. The man believed that Mr Serna was carrying a pistol, he later said. In the second incident, Mr Serna approached two female neighbours in their driveway shortly after midnight and demanded to see inside their vehicle. Mr Serna again kept his hand on an object inside his jacket pocket during the encounter. The woman ran inside her house and called police to report that she had seen a dark brown or black-handled object which she believed was a gun. As officers spoke to the women, Mr Serna left his house and began walking towards them, which led to the fatal shooting, said police. Officers opened fire about 20 to 30 seconds after the woman had pointed Mr Serna out to them, Chief Martin said. "My dad did not own a gun. He was a 73-year-old retired grandpa, just living life," his son, Rogelio Serna, said. "He should have been surrounded by family at old age, not surrounded by bullets," he told the LA Times. 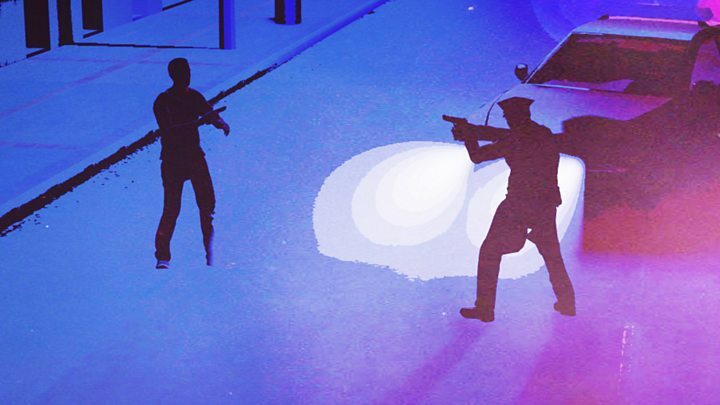 A 2015 Mapping Police Violence study rated Bakersfield Police Department as the deadliest in the country, logging 13.6 killings for every million people, compared with a US average of 3.6. Video Do people get shot because some cops panic?